Going to reserve a parade spot in the morning on the 4th? Don't forget about the Freedom Run at 7:30! Going to reserve a parade spot in the morning on the 4th? 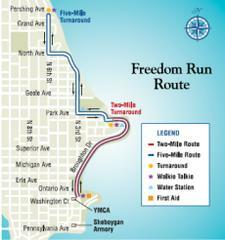 Don't forget there's a Freedom Run at 7:30 AM. Broughton Drive from Wisconsin Avenue, north and up the hill to Barrett Street will be closed to vehicle traffic and parking beginning at 7:00 AM. 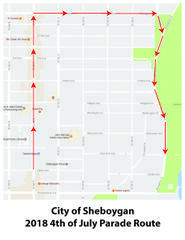 The City of Sheboygan Independence Day Parade is on Wednesday, July 4th, 9 AM, downtown Sheboygan. You may bring tarps and chairs to hold a spot between the sidewalk and the street along the parade route AFTER 5:00 AM on July 4th. Any items placed out prior to that time will be considered abandoned property and removed. The reason for this policy is to minimize the amount of overnight vandalism as well as minimize arguments over claimed areas. Broughton Drive will remain CLOSED to vehicle traffic. Parking will be PROHIBITED from MICHIGAN AVENUE, south to WISCONSIN AVENUE, for the safety of pedestrians and the lakefront activities. Parking will be PROHIBITED along the north side of PENNSYLVANIA AVENUE from N 8th STREET, west to N 14th STREET, all day to provide two lanes of westbound traffic leaving from the lakefront. We wish everyone an enjoyable and safe holiday!